To maximize teaching potential and minimize distractions, I teach out of a dedicated piano studio suite, complete with a waiting area, bathroom, and exterior entrance. The entire suite is isolated from the rest of my residence, providing a quiet and interruption free space. A professional Yamaha Grand Piano (Yamaha A1) that features the same action and feel as Yamaha's legendary Concert Grand Piano lineup, is the focal point of the studio. Large windows provide ample natural light during the day, as well as beautiful views of the mountains overlooking the Chilliwack River valley. Although some might argue that a Grand Piano is not necessary to teach on, Yamaha provides all the pianos used locally at RCM piano examinations. Here students learn the feel of the Yamaha key action, and experience the depth of sound and dynamics that will be available, and expected of them in performance and testing. If parents want to sit on their children's lessons (which is encouraged), there is a comfortable chair, as well as some reading materials provided for them. Modern media is incorporated into lessons, often in the form of videos, audio, or tracks to play along with. Professional digital composition software (Sibelius First) is also available for students to learn on and document compositions. A dedicated table is provided for music theory students, giving ample room whether the student is in private, or group lessons. A private studio entrance that is separated from the rest of the dwelling, leads directly into the studio waiting area and bathroom. A dedicated bathroom is situated just off the waiting area, where students are expected to wash off their school-day germs before entering their lesson or touching the piano. Students (and parents) can wait for their lessons or pickup in the dedicated waiting area just off the piano studio. A padded bench, coat rack, and shoe tray are provided. 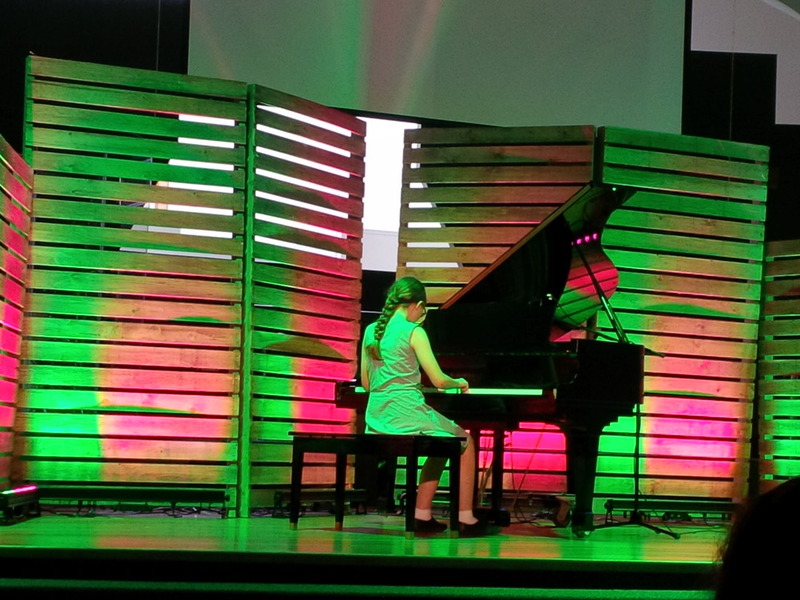 See below for photos from previous Piano Recitals. Recitals are usually held twice a year, and are designed to be a fun time to celebrate student progress, and give students practice at performing. There are draws, awards, and door prizes. And lots of stage lights!!! Everyone gets to select and perform in their own personal color palette. Students and parents compete at the beginning of the 2015 Christmas recital by playing a fun game of Kahoot, testing their music theory knowledge.